→Dremel 3000 vs 4000 | Which Rotary Tool ? Dremel 3000 vs 4000 | Which Rotary Tool ? Dremel 3000 vs 4000 which is the right rotary tool for you ? ​The Dremel 3000 is powered by a 1.2 Amp motor and has a variable speed range of between 5,000 and 32,000 RPM. It is an older model than the Dremel 4000. There are three variations in the 3000 range. The 3000 1/24, 3000 1/25 and the 3000 2/28. The ​3000 1/24 has one attachment(sanding) and 24 accessories. The bulk of the accessories are geared towards sanding in one form or another. The 3000 1/25 has one attachment and 25 accessories.​ The extra accessory over the 1/24 model is an added clear shield. The 3000 2/​28 comes with two attachments and twenty eight accessories. The attachments are a sanding/grinding attachment and a cutting guide. The majority of the accessories are for either grinding, sanding or polishing. Who is the 3000 2/28 for ? 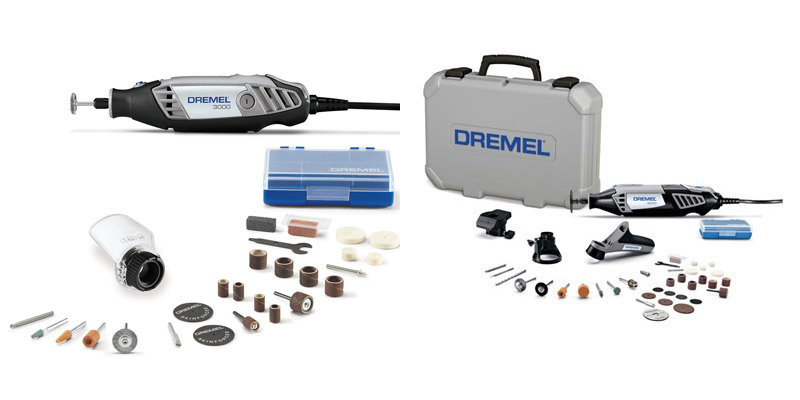 ​The Dremel 4000 is a variable speed rotary tool that is powered by a 1.6 Amp motor. That motor has a speed range of between 5,000 RPM and 35,000 RPM. The 4000 also includes "electronic feedback". This features allows the motor in the 4000 to adapt to how it is being used. For example if you run the tool at a specific setting then when you press against the material you are working on it will ensure that the friction does not slow down the speed of the motor. There are 3 models available in the 4000 range. The 4000 3/4, 4000 4/34 and the ​largest kit which is the 4000 6/50. The attachments are sanding/grinding guide, circle cutter and straight edge guide, tool sharpener, shield and lawn mower and a flex shaft attachment​. ​The accessories are a mix of grinding, sanding, polishing, cutting and engraving bits. The Dremel 4000 especially in the 6/50 kit has a heck of a lot of actions that it can perform. It is a very capable tool for just about anyone that needs to do a lot of small fine detail work. You can see how the 4000 stacks up against some others in the Dremel range in our Dremel 4000 vs 4200 article and Dremel 4000 vs 4300. ​So which is better Dremel 3000 vs 4000 ? ​However if all you really need a rotary tool for the occasional bit of sanding the 3000 is still quite capable. But, it does not have either the power or the versatility of the 4000 range.